Designed for passionate photographers – amateurs and professionals alike – this workshop covers all aspects of Camargue photography. 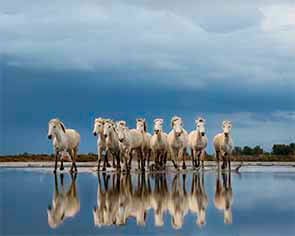 It encompasses several shoots of the famous Wild White Horses with varying compositions in different locations, the imposing Black Camargue Bulls thundering their way through the shallows of the marsh, iconic Pink Flamingos as they take flight in V-formation as well as a vast array of birdlife, Classic Portraits and beautiful Landscape views. This workshop appeals to Wildlife and Equine photographers, but also opens the door to those wanting to learn more about all aspects of outdoor photography. Informal dinner at local bistro (optional). At dawn, we photograph an old mediaeval lighthouse and quaint fishing Port – capture atmospheric shots of the harbour with old fishing boats and trawlers reflecting in the water and nets draped out to dry in the sun. After breakfast, we spend the morning shooting portraits of the Gardians (Camargue Cowboys) with their ‘weathered’ faces – they are perfect subjects for stunning black and white classic portrait photography. Serge demonstrates how to obtain a classic portrait, along with some great tips for working with subjects who may not be comfortable in front of the lens. You will learn about composition, lighting techniques using daylight and portable flash, lens choice and how to deal with the elements around you. In the afternoon, we shoot typical Camargue landscape views – the sun setting on the lagoons, golden reeds, fishermen’s boats reflecting in the water, pink flamingos and other birdlife. We spend a day at the Parc Ornithologique, which is a natural Camargue wetlands area of great importance. Accompanied by Thierry Vezon, BBC Wildlife bird specialist and expert in his field, we will have exclusive pre-dawn access to the park long before it is opened to the public enabling you to photograph the birds exclusively in the early morning light. Thierry will guide you to the prime locations among the waterways and lakes to capture a wide variety of species in one of the largest arrays of birdlife in Europe, from single birds perched at the nest to large flocks of pink Flamingos. At dawn, we head to the beach to photograph a black stallion running along the white sand and in and out of the sea – the black against the white of the beach and sea makes for a dramatic combination. In the afternoon, we photograph the Camargue Black bulls in action thundering their way through the marshy shallow water, their horns held high, herded by the Gardians on horseback for a unique photographic experience. 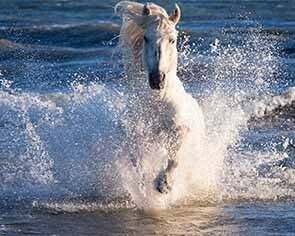 In the morning, we head to the beach for a shoot with a single white Stallion. We photograph him dashing and diving in and around the sea and surf, as well as rearing on the top of the sand dunes, making for a wide range of dramatic action shots. In the afternoon, we photograph the Wild White horses running through the marsh. We shoot several drives with the horses running across and towards your field of view. We will also take shots of the ‘Gardians’ (Camargue Cowboys) dressed in their traditional Camargue shirts & hats, trident in hand, surrounded by the herd as well as some close up portraits of these perfectly ‘weathered’ ranchers. At dawn, we photograph the horses splashing through the shallow waters of a marsh in a new location and with a different composition. We will also capture the ‘Gardians’ at work herding the wild horses. Late afternoon, we get to capture the ultimate Camargue scene of the Wild White horses running through the surf along the beach with sea spray flying. After the action, we then take single shots of the horses on their own with or without the ‘Gardians’ as the sun sets. In the evening group closing dinner at typical Camargue restaurant with Flamenco music (optional/depending on the time of year). At dawn, we photograph the sparring stallions– this is a unique opportunity to see the White horses entwined at full height, in feisty temperament with their manes flying! Free time for lunch before afternoon departures to the airport. Before you book your flights, you might like to consider arriving a day or two earlier or staying a day or two after the workshop to make the most of the beautiful region and sunshine – we also offer an incredible horse riding experience as well as other excursions & activities – just ask Ros for further details.